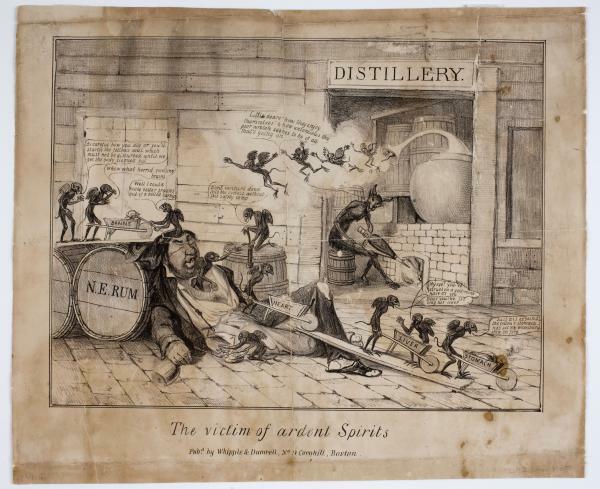 This political cartoon graphically details the effects of ardent spirits on the body. The victim is lying in a drunken stupor on the floor of the distillery. His head rests of a barrel labeled N.E. RUM. The Devil fans the flames of the still in the background while watching his agents—small, winged demonlike creatures—as they pick apart the victim's abused body. Three little demons are scooping out the victim's brains into a wheelbarrow. One of the demons says, "Whew what horrid smelling brains," while his companion remarks, "Well I could make better brains out of a boiled turnip." The third demon in the group says, "Be careful how you dig or you'll startle the fellow's soul, which must not be disturbed until we get the body cleaned out." Another demon emerges from the victim's chest cavity. A demon kneeling on a barrel hands him a light and cautions, "Don't venture down into the bowels without this safety lamp." Other demons are pushing wheelbarrows marked Heart, Liver, and Stomach down a plank that leads from the victim's abdomen. One of the little demons examines the victim's liver and gleefully remarks, "My eye! You've struck on a gold-mine." The demon hauling out the victim's stomach says, "Just as I expected, the fellow's stomach has set my wheelbarrow on fire." While the drunken man slumps against the rum barrel on the floor another demon is sneakily emptying the man's pockets of all of his coins. The victim is unaware of the robbery as he lies in tattered clothes, clutching a rum glass in his hand. Be careful how you dig or you'll startle the fellow's soul which must not be disturbed until we get the body cleaned out. Little dears, how they enjoy themselves & how unconscious the poor wretch seems to be of all that's going on. Whew, what horrid smelling brains. Don't venture down into the bowels without this safety lamp. Well I could make better brains out of a boiled turnip. My eye! You've struck on a gold mine, haven't you? Bless you! No. It's only his liver. Just as I expected, the fellow's stomach has set my wheelbarrow on fire. Exact Title: The victim of ardent spirits. Dimensions: 23.1 x 30.7 cm.